Format: 2/3 Rounds, 2/3 Games (LF, WF, GF – 3/5 games), Double Elimination, 99 Seconds, Random Stage Select. Prizes: Full prize pool to be announced in the lead up to the event. The prize pool will include of a share of the cash entry fees for each tournament entrant, in addition to a $500 pot bonus. BAM8 is a Capcom Pro Tour Ranking Event; finalists will receive CPT ranking points towards qualification to the Capcom Cup Finals. The tournament champion will also win qualification, flights and accommodation to the Capcom Pro Tour Asia Finals in Korea later this year. Prizes: Full prize pool to be announced in the lead up to the event. The prize pool will include of a share of the cash entry fees for each tournament entrant, and a pot bonus of $1000 courtesy of Tecmo Koei. 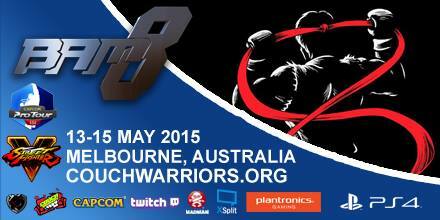 BAM8 is a DOA Battle Royal circuit event; the tournament champion will win qualification, flights and accommodation to the Battle Royal finals, held at NEC XVIII in the US later this year. Legal Stages: Final Destination, Smashville, Town and City, Lylat Cruise, Battlefield, Dreamland 64 (Counterpick Only). At the start of a match stage striking will be employed at the judge’s discretion. You may not choose the last stage you won on in a counterpick situation, unless both of the players agree to it. Prizes: Full prize pool to be announced in the lead up to the event. The prize pool will include of a share of the cash entry fees for each tournament entrant. An additional prize pool of $500 will be split between the three highest placing Australian competitors. Rules: If a player wishes to pick a character without the opponent being able to counterpick, they can choose to enact a double blind, where both players will inform a TO of their pick and then the TO will announce both of the characters. Wobbling is legal, but wobbling past 250% is to be considered stalling and is not allowed. Additional rules apply, please consult with available tournament judges. Prizes: Full prize pool to be announced in the lead up to the event. The prize pool will include of a share of the cash entry fees for each tournament entrant, as well as a $1000 pot bonus courtesy of Bandai Namco. Judges: The organisers for Tekken 7 are Baraa and Youssef. Rules: All characters allowed (including Jam, Jack-O, and Johnny). Players who lose a game may change their character, and the winning player is character locked until they lose. Blind pick is available for all matches. Rules: Unlimited Characters banned. All other normal characters allowed. Players who lose a game may change their character, and the winning player is character locked until they lose. Blind pick is available for all matches. Prizes: Full prize pool to be announced in the lead up to the event. The prize pool will include of a share of the cash entry fees for each tournament entrant, and an additional pot bonus of $300.